For the purposes of discussion, we will assume the Fluke 88V is correct. Let's face it, nobody likes tools that lie. And as a consequence, serious individuals demand that their tools are calibrated. It is not that I do everything with a high level of precision, but I feel comfort in knowing my tools are upholding their end of the deal. 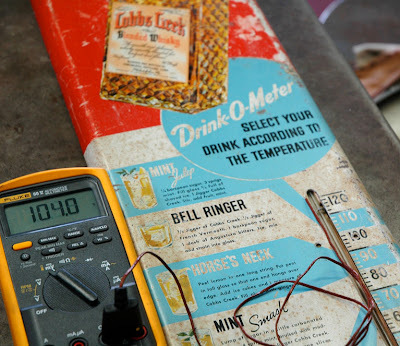 Suspecting that friends might think I was over exaggerating the Hooptyrides average temperature this week, I decided to calibrate the Cobbs Creek Drink-O-Meter thermometer to determine just what I was up against. 104 F, inside. 110 F, outside. The Bell Ringer, Horse's Neck and Mint Smash - no matter how appealing they sound - are clearly not going to cut it. Mint Juleps will be enjoyed inside, but outside we are getting perilously close to 'too hot to imbibe.' Perhaps temperatures over 110F will require hitting the bottle straight. Like a cannonball.